In this new blog series, we will be profiling famous individuals who continued to persist and make a lasting impact on the world despite the challenges and debilitating nature of untreated OCD. Our first blog focuses on Nikola Tesla. Nikola Tesla is enjoying something of a renaissance today. He is the namesake for the innovative electric car company and is rumored to be the subject of a forthcoming movie by Disney. He has also become a hero for geek culture worldwide — the famous internet comic The Oatmeal has devoted multiple comics to Tesla, and even started a campaign to raise money for a Tesla museum when Tesla’s original laboratory in upstate New York went up for sale. Nikola Tesla was born in Eastern Europe in what is now Croatia in 1856. From an early age, Tesla demonstrated both genius and obsessive traits, the latter of which it seem to have haunted him throughout his life. We now know that for many individuals, OCD begins in childhood and adolescence. For Tesla, however, at least early on, it appears that his creative drive overshadowed his mental health struggles. He was known for learning languages quickly, and he reportedly worked through days and nights on only a few hours sleep. 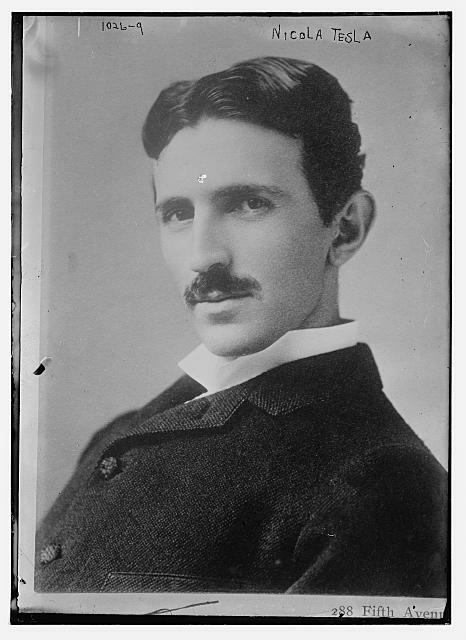 As a young student, Tesla challenged reigning theories and technologies, looking for better, more efficient solutions. At the age of 19, he was debating his university professors over perceived design flaws in the direct-current (DC) motors that were being demonstrated in class. Even this early in his life, he was already questioning existing technologies, searching for smarter, more efficient ways of doing things. Only a few years later — still in his early 20s — Tesla began working on a new motor with rotating magnetic fields created by two or more alternating currents. Tesla recognized that at very high voltages, alternating current (AC) would be more efficient, cheaper, and easier to transmit than direct current. As a result, Tesla’s later refinement of AC power technologies would prove to be the key to the long distance transmission of electricity, arguably ushering in the modern age. Persistence, it seems, was a hallmark of Tesla’s personality. Tesla emigrated to New York City in 1884 with only four cents in his pocket. His first job was at Edison Machine Works with Thomas Edison where he quickly helped solved some of the company’s most difficult problems with direct current (which Edison favored). Unfortunately, this relationship soured early on with Tesla and Edison having a falling out over compensation, resulting in Tesla resigning. This bittersweet theme of great accomplishment and great disappointment appeared to follow Tesla throughout his life. However, Tesla eventually did patent his AC motors and caught the attention of George Westinghouse (a competitor of Edison). In a key event in the history of electricity, Westinghouse and Tesla demonstrated the safety and reliability of AC power to the American public at the 1893 World Fair in Chicago. Imagine fighting the demons of a mental illness and yet working with Edison and Westinghouse — two of the most influential figures of the early 20th century. We know that stress exacerbates OCD symptoms. One has to wonder how working closely with these two powerhouses must have affected Tesla. What might Tesla’s life have been like if he lived in an age where more was known about OCD, and mental health in general? Amazingly, Tesla contributions are not just limited to electricity. His innovations and discoveries have impacted everything from fluorescent lights, X-rays, and wireless communications. For example, although Guglielmo Marconi successfully sent the first trans-Atlantic radio signal from England to Newfoundland, it was done using 17 of Tesla’s patents! The U.S. Supreme Court ultimately upheld Tesla’s intellectual property claims on Marconi’s technology, clarifying Tesla’s role in the invention of the radio—but, sadly, it was not until 1943, after he died. So many of Tesla’s ideas (wireless electricity, for example) were so far ahead of their time, and were not fully appreciated until recent years, in some cases. A look at the list of the 112 patents Tesla was granted throughout his life, shows just how big an impact he truly made on technology. Throughout Tesla’s life, we see this theme of true brilliance and creativity shadowed by controversy and hardship. And in fact, later in Tesla’s life, it was clear to anyone paying attention that he was struggling with what we now know is severe OCD. And so, it is easy to read the story of Tesla’s life and think that it was an exercise in futility and failure — feelings that many individuals with OCD can identify with. But that is only one part of the story. Instead of getting lost in the injustice that Tesla endured or the difficulties and pain that he surely experienced toward the end of his life when mental illness outpaced his creativity and innovation, perhaps we should look at his lasting legacy, and be that much more impressed that he accomplished as much as he did in the face of such adversity. His tenacity, brilliance, and lasting legacy should be an inspiration to us all. Great! Thanks for the information. I look forward to the next one. Fascinating. I hope you do one on Howard Hughes. Thank you for sharing this. It is very inspirational. What an amazing man! It is Musk who has resurrected the accomplishments of this tender soul.